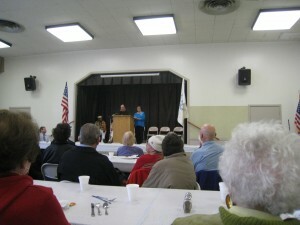 On Monday December 7, 2009 Michael and Jean-Marie were the keynote speakers at a breakfast and memorial of the Pearl Harbor Survivors Chapter 23 (Sonoma, Lake, and Mendocino Counties), at the Santa Rosa Veterans Memorial Building, Santa Rosa, CA. 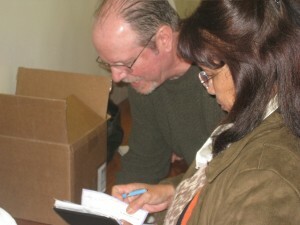 Read the article from Chris Smith of the Santa Rosa Press Democrat here. 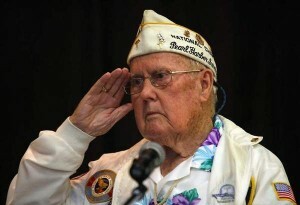 Pearl Harbor Survivors Association chaplain Herb Louden salutes the presentation of the colors. 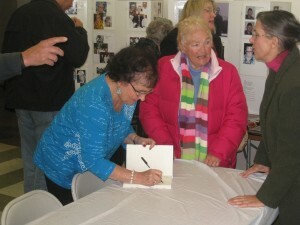 Author Michael McCoy thanks the veterans and introduces Jean-Marie. 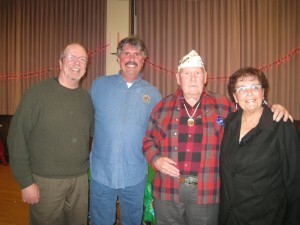 Michael McCoy, Gary Magnani, Commander of the American Legion Jack London Post 489, Herb Louden, Pearl Harbor Survivors Association chaplain, and Jean-Marie Heskett, at a dinner that followed the event.